New York Toy Fair kicked off last night, with a weekend of fun toy reveals to follow. Attendees of the trade show got their first look at some of the licensee's booths and products. Our pals over at Jedi News were among those in attendance and they posted some pictures of the Hasbro booth, which included a massive, wall sized version of the The Last Jedi packaging. 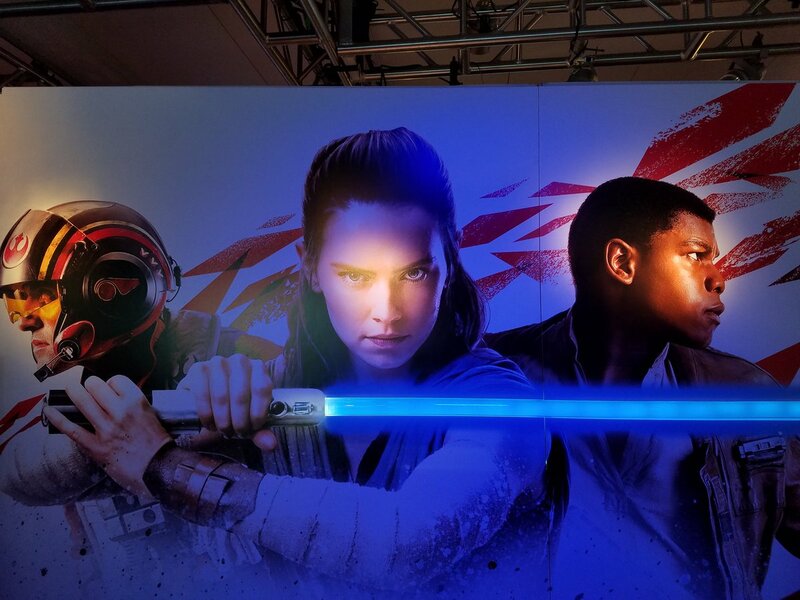 The pictures show slightly more of the costumes that Rey, Finn, and Poe will be wearing when The Last Jedi hits theaters later this year. For fans looking for more The Last Jedi reveals out of Toy Fair, while it's not impossible, I wouldn't hold your breath. If there are any The Last Jedi products on display, pictures likely won't be allowed of them. For example, Justin from Jedi News did see a The Last Jedi calendar which featured Rey, Finn, Luke, and Kelly Marie Tran's character, but could only describe it in tweets and could not photograph it. Regardless, it was cool to get a slightly better look at the main cast's new costumes, even though they appear to more or less the same costumes they wore in The Force Awakens. (Finn does appear to be wearing a similar shirt to the one that Poe wore at the start of Episode VII, which probably means it's standard Resistance garb).